The goal of this session is to help you change any behaviors and preconceptions that people may have about training. This change will therefore drive a return on investment as the more engaged your learners are, the more likely they are to go the extra mile to succeed in your company. It is easy for any organization, large or small, to get in the habit of just piling information onto their employees and not really paying attention to the method in which this training is delivered. Any successful learning system must have the goal of behavioral change at the heart of it. This session will cover why traditional e-learning is on the way out, and the benefits of putting the engagement formula into action. Apply your new-found knowledge of e-learning to your everyday work-life, helping your organization and individuals alike to unleash their inner superheroes! Understand the limitations and practical application of both mobile and microlearning. Discover the power of gamification and game-based learning. Explore the potential of campaign learning, and more! Expect to find Juliette Denny stepping up to your stage wearing a cape and covered in badges, teaching your audience to transform learning zombies into learning superheroes. 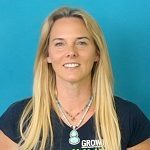 Juliette is the ideologist in chief (aka managing director) at Growth Engineering, and her unwavering mission is to wage war on dull online learning! She is a pioneer and expert in applying gamification and social functionality to online learning. She has an unrivalled passion for learner engagement, which leaves audiences inspired and electrified. Juliette is the complete package. She’s an influencer, an expert and she also has direct access to primary research through her own products and solutions – meaning that her talks are packed full of stats and case studies proving the truth in what she’s saying. Juliette has also been named #30 on the eLearning Movers and Shakers list, which just so happens to be the highest any learning technologies vendor has placed!